"I wanted to write a book that would help correct Western stereotypes of Islam, especially the image of Muslim women as docile, forlorn creatures." I've long been interested in Middle Eastern perspectives on the West, Western perspectives on the Middle East and the Muslim experience. I think it started with Persepolis and grew from there. In any case, I think it's important to learn about, or at least expose oneself to the ideas of Middle Eastern culture, history - modern and otherwise - and religion. With that in mind I picked up Shirin Ebadi's Iran Awakening; One Women's Journey to Reclaim Her Life and Country. Ebadi won the Nobel Prize in 2003 "for her efforts for democracy and human rights. She has focused especially on the struggle for the rights of women and children." 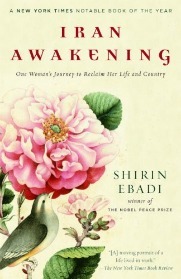 Iran Awakening is Ebadi's memoir, with a focus on her struggles with political prosecution during the Iranian Revolution. Ebadi's persepctive is a unique one; she grew up in Tehran and prior to the Islamic Revolution, became the first female judge in Iran. Four years later, as a result of the 1979 Isalmic Revolution, Iran's view of women changed and Ebadi was demoted to a clerk and eventually "retired" early. Ebadi stayed in Iran as she watched her many of her friends flee. She managed to eventually earn herself a professional and political role in the emerging theocracy and worked to promote equality and human rights, going above and beyond to help and defend those in need. Iran Awakening is less a political or historical memoir and more an account of one women's struggles and ability to overcome persecution. Ebadi's prose is smart and fluid, welcoming and eloquent. Her story is one of brutality and triumph, of faith and hardship. When the gravity of death first touched me, I'd found preoccupation with the minutiae of daily life meaningless. If we ultimately die, and turn to dust in the ground, should it ever truly upset us if the floor hasn't been swept quite recently enough? Edabi's story speaks to the power of one voice to make a difference. While Ebadi hopes for a free and democratic future for Iran, she still speaks of her country with loyalty and admiration. If you are interested to learn more about Iran's modern history and its struggle for democracy and equality from a unique and relevant perspective, I urge you to read this book. hmmm... a book with an agenda. That's hard to pull off. I'm glad she managed to do it and that you liked it. I read this one a few years ago and completely agree with all you said. Great review -- I hadn't heard of this book but I'm eager to read it -- I really think it's crucial to read about more cultures, especially when there's so much Islamophobia in the U.S. Nice review!